Top and middle left: photos by Jenn Burt. Bottom left: this species usually grows in clumps, which helps prevent it from being mis-identified as a worm. 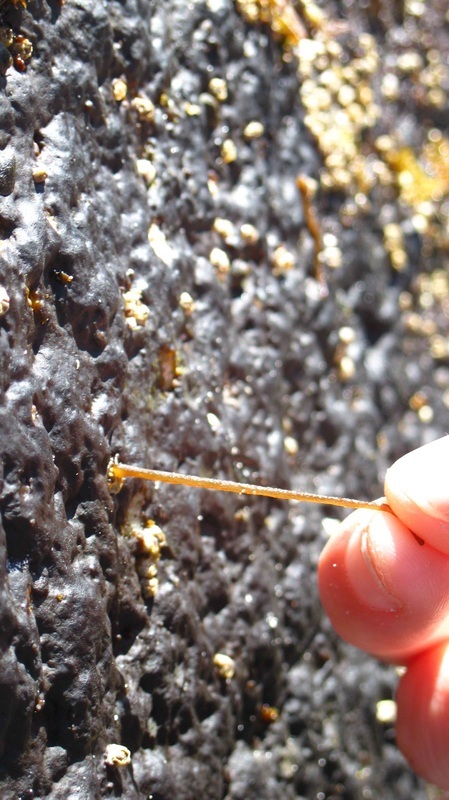 Right: a single specimen of rubber threads, photographed by Julia Fisher. 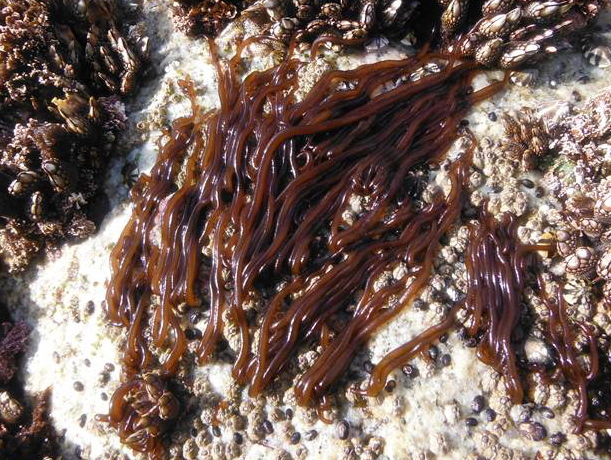 The gametophyte of this red seaweed resembles long smooth worms or cooked spaghetti. It is usually reddish-brown in colour, though it may vary to deep purple or golden brown. It is solid and rubbery; branching is rare, and doesn't occur near the tips. It tends to grow in clumps, attached to rocks by a small cushion-like holdfast. While it can grow to 45 cm long, it is usually no more than 20 cm. The sporophyte for this species is microscopic. 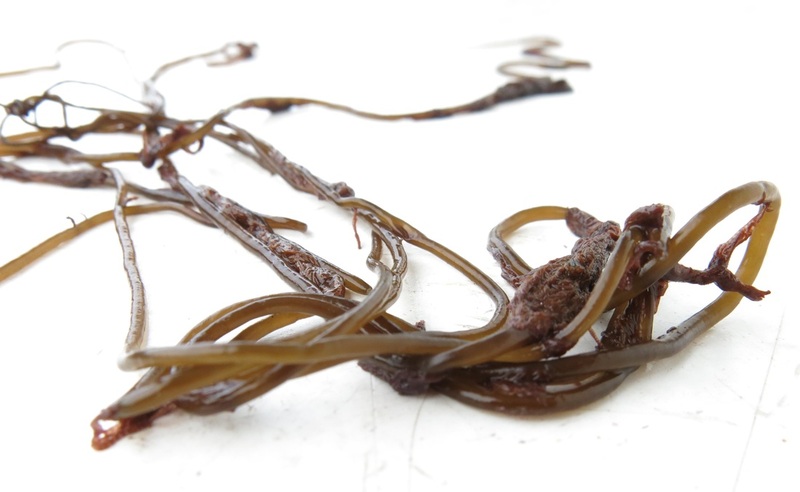 This seaweed can be found during the summer months on exposed rocky shores, usually growing on or around mussels, barnacles, and limpets. Its eastern Pacific range extends from northern Alaska to northern Mexico; it is also found along coastal Japan, Australia, New Zealand, and the North Atlantic. This species may be mistaken for a marine worm if not examined closely enough. Guiry, M.D. & Guiry, G.M. 2014. Nemalion elminthoides (Velley) Batters. National University of Ireland, Galway. Accessed 27/11/2014. Lindberg, M. and Lindstrom, S. (2010). Nemalion elminthoides. 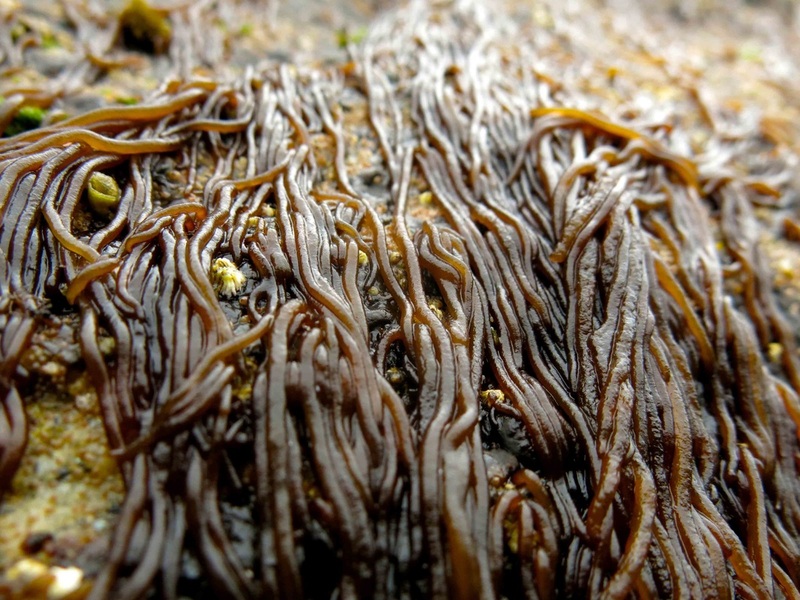 Seaweeds of Alaska. Accessed 27/11/2014. O'Clair, R. and Lindstrom, S. Nemalion helminthoides (Velley) Batters. In Klinkenberg, Brian. (Ed.). E-Flora BC: Electronic Atlas of the Plants of British Columbia. Lab for Advanced Spatial Analysis, Department of Geography, University of British Columbia, Vancouver. Accessed 27/11/2014. Kelly Fretwell, Bridget Woods, and Brian Starzomski (2014).